Cast: Natalie Portman, Raffey Cassidy, Jude Law, Stacy Martin, Jennifer Ehle, William Dafoe. ‘Vox Lux’ is the latest cinematic endeavor of a darling of the Venice Film Festival: Brady Corbet (who won Best Debut Film and Best Director with the movie ‘The Childhood of a Leader’ in 2015). The conventional storyline of an ingenue girl who becomes corrupted by the world of showbiz, is commonplace in content but jazzy in terms of style. We observe the rise from the ashes of a major national tragedy to pop superstardom. The film — narrated by the suave voice of William Dafoe — spans throughout 18 years of Celeste’s life (from 1999 to 2007). Natalie Portman is effective in portraying the histrionic and frenzied 30-year-old Celeste. An interesting choice made by the director was to have Raffey Cassidy play both Young Celeste and her adolescent daughter, Albertine. The latter — born when Celeste was very young — echoes the lost wholesomeness of her mother, when she was a teenager who survived a violent tragedy and began her pop-career merely by singing at a memorial service. Stacy Martin is also exceptional in playing Ellie, Celeste’s sister, from the years of their adolescence throughout their adulthood, embodying the transformation of their relationship. If Eleanor as the elder sibling had everything in control when her younger sibling was an ordinary girl, after Celeste’s stardom Ellie becomes her exploited assistant. Also Jude Law as the pop-star’s Manager and Jennifer Ehle as the Publicist play their role by the book. Despite the good acting, the story plays a familiar tune. And yet it is enriched by the choice of medium (the film was shot on 35mm) and the original songs by Sia and Scott Walker. 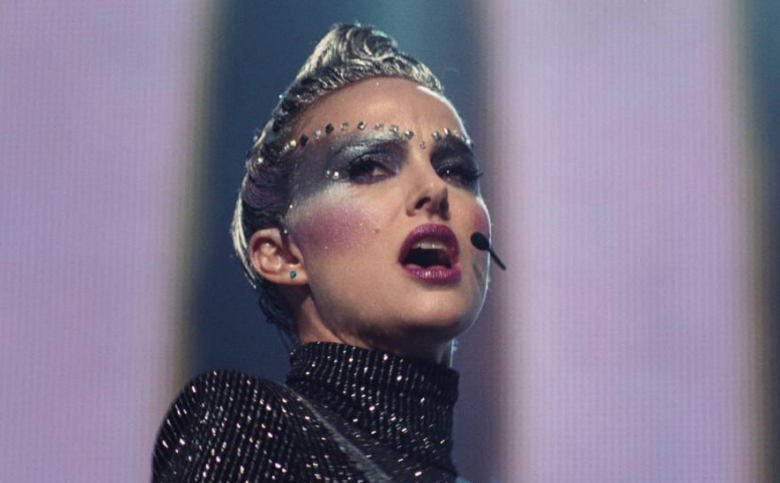 ‘Vox Lux’ is visually flamboyant — from the costumes to the rhythmical editing, that create an experience that is pleasurable for the eye. This pop-music gouache, thus becomes a conventional and predictable emblem of the cult of celebrities and the media machine that operates behind them.